Explain something to me: We have laws in this country that regulate all kinds of potentially dangerous substances, from toxic chemicals to alcohol and drugs. But why don't have stronger anti-Slurpee laws? It's time for the government to crack down on these frozen sugary death-drinks! Don't believe me? 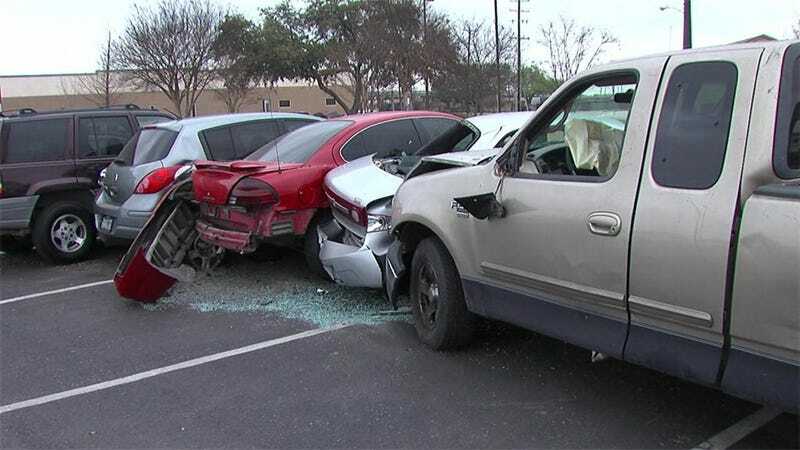 Then check out this story from my hometown of San Antonio, where a Slurpee-induced "brain freeze" was cited as the reason this pickup truck driver crashed into four other cars. According to WOAI San Antonio, the driver was drinking a Slurpee behind the wheel when he encountered a brain freeze so intense that he blacked out and lost control of his truck. When the man finally woke up, he had hopped a curb and piled into several other cars and his foot was stuck on the accelerator, according to the TV station. Now, I know what you're gonna say next: "The dude was totally drunk." Except FALSE! He apparently passed a sobriety test administered by police. No injuries were reported. Hey, politicians: why don't you get off your lazy asses and do something about the epidemic of Slurpee violence that is consuming this country? Do you really want something out on our streets that can "freeze" your brain and is readily available at any 7-11? Someone needs to think of the children!